When the Berlin Wall came down in 1989, East Germany's secret police, the Stasi, frantically tore up millions of files gathered during decades of spying on its own citizens. 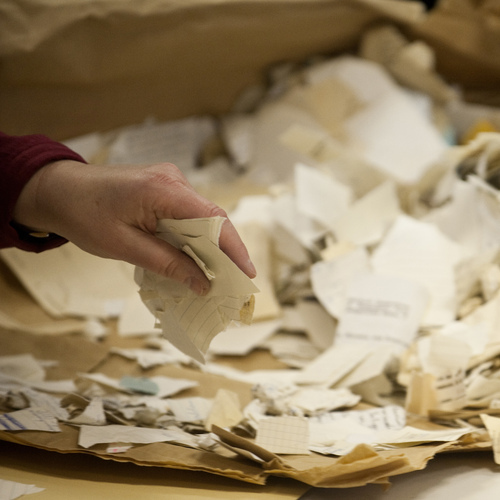 More than two decades later, the vast array of secret papers collected by the Stasi is still in huge demand. So far this year, 70,000 people have applied for access to the Stasi archives. Many are young Germans — some searching for information about relatives, others just eager to know more about their country's past. To help meet this demand, archivists are now using groundbreaking computer technology to reconstruct those shredded files. There's another option: pattern recognition computer technology developed by German scientists, called the E-puzzler. The E-puzzler is basically a shredding machine in reverse. You scan torn-up documents into it. It matches up the pieces using color, paper texture, fonts, tear lines and other details. "The E-puzzler works in the way that a person doing a 1,000-piece puzzle would work. You start at the edge. You look for the forest, you look for the lake and the sky, and that is exactly how the E-puzzler works," says Joachim Haeussler, the archivist in charge of digital reconstruction. Though most of us don’t have ancestors from East Germany, it’s fascinating to learn how technology is being used to help with this huge jigsaw puzzle! Have you ever opened a folder or box at an archives to find that you essentially have a pile of document pieces? Wouldn’t it be neat to scan those and have something like e-puzzler re-create the original documents? What other technology or apps are out there that help with the reconstruction of partially destroyed documents?